THANK YOU to our amazing parents and anonymous donors for helping St. Nicholas deliver a wonderful St. Nick Surprise again this year! Every student received one! 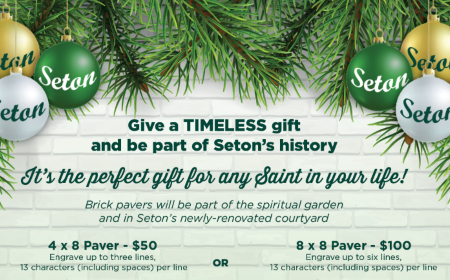 We are so blessed to have such generous Seton parents and supporters in the Seton Community. 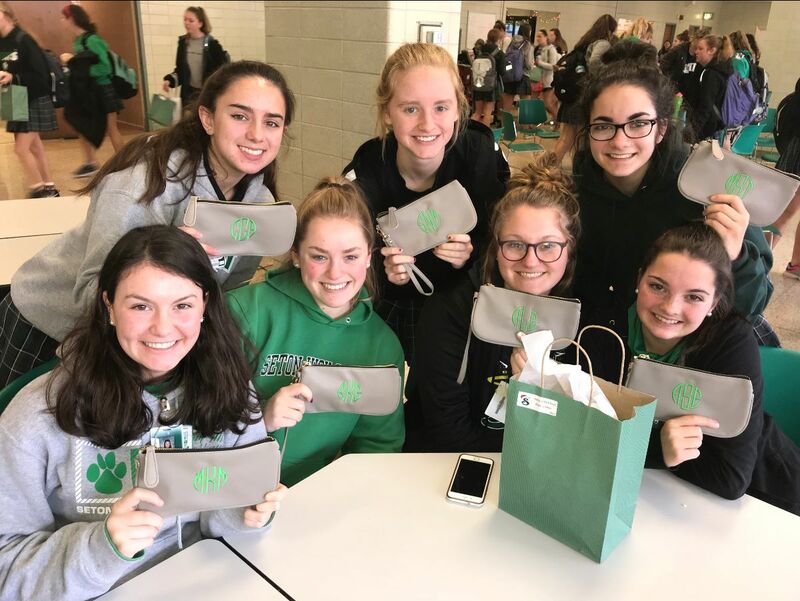 This year's gift was a wristlet personalized with each girl's monogram. Our students have been working hard to wrap up the end of the quarter and prepare for exams, so it was nice to have a little break for our Saints to celebrate Christmas with their House and Mentor groups this week! They had some festive fun with food, ugly sweater contests, karaoke, cookie decorating, games and door decorating. Thanks to a very generous donor, Seton is thrilled that we will again be raffling off a car this year at Setonsation in March! Students have begun selling raffle tickets for the 2019 Honda Pilot Touring and the first prize patrol arrived this week with a special visit from Santa himself! This beautiful car is decked out with all the jingle bells and whistles that any car owner could dream of. Students were given chances to sell or they can be purchased online for $50 for one chance or $200 for six chances. To see the car and to buy your chances, click HERE. Thank you for your support! As Christmas gets closer, we hope that you and your families make time to prepare your hearts and feel the hopefulness, joy and peace of the Advent season! Thank you for all of your prayers and support! Parents are encouraged to reach out to their daughter's teachers and/or Academic Advisor with any concerns as we move toward the end of the semester. Report cards will be sent out the second week of January. Also in January, the Curriculum Guide for the 2019-2020 school year will be available on our website and students will begin the scheduling process for the next school year. Changes to course offerings will be announced at this time. Congratulations also to Monica White, recipient of the San Damiano Scholarship from Marian University in Indianapolis. Congratulations to senior Olivia Faillace who competed in the 2018 Zoo Plein Air this fall. She was among 47 students and more than 100 entries in this high school student art competition that is put on by Cincinnati Art Club and Cincinnati Zoo and Botanical Garden. Olivia received the Cincinnati Art Club Artist Choice Award presented to her by Thane Maynard. Next month we will begin the course scheduling process for the 2019-2020 school year. Earlier this week the Academic Advisors met with all students in a brief group advising session in which students were encouraged to begin thinking about the level of courses that they wish to take next school year. Between now and Christmas break, students should notify their teachers if they wish to move up or down a level in a particular course. Throughout the month of January, students will have a one-on-one meeting with their advisor in which they will review their course recommendations and select courses for the coming year. All courses will be approved by parents before the course schedule is finalized. In freshman group advising sessions this week the semester exam schedule for December 19-21 was discussed. Students identified best practices for an effective study plan and time management during this busy season. Families of seniors: if you have not already filed the FAFSA, you are encouraged to do so immediately. If you have questions about the FAFSA, please contact the Financial Aid Office of the school that you are likely to attend. The FAFSA website is www.fafsa.ed.gov. Now is a great time for seniors to begin applying for scholarships. Remember to utilize the Scholarship List and Scholarship Search functions in Naviance Student. Every student has her own Naviance account. If parents would like to create an account but have lost their registration information, please email your daughter’s academic advisor. Please note that most scholarship committees update their application materials after January 1. Seniors are encouraged to apply for the $1,000 David Kreuter Memorial Scholarship; deadline 1/31/19. See Naviance for details. Coldwell Banker Real Estate is offering a scholarship to a student who is battling cancer or who has endured cancer during her childhood. The scholarship will be put toward the current high school tuition for 9-11 grade students or to college tuition for a graduating senior. To learn more about the scholarship or to obtain an application, please have your daughter see her Academic Advisor by December 12. February 20, 2019 is the state-required ACT for juniors. This is an online test given during the school day. April 2, 2019 is College Planning Night at Seton. Save the date! Congratulations to sophomore Golfer Lily Bryant who was named as SWOHSGGC Honorable Mention All Star 2018 D1. The winter sports have kicked off their seasons. Basketball competed in the Walnut Hills Kick-off Classic over Thanksgiving weekend. The Bowling Team is hosting the Holiday Classic at Western Bowl on December 8. The Swim Team won against St. Ursula Academy and Princeton High School. They are competing against Walnut Hills High School on December 8 and getting ready to for Best of the West on December 11. Diving competed in its first meet on December 5 at the University of Cincinnati and are ready to compete at the Best of the West on December 11. Seton has three gymnasts featured on the Oak Hills Gymnastics team and they are practicing for their first meet in January. The JV and Varsity Dance teams have been very successful so far this season. The Varsity team won all of their competitions and the JV team placed first at the UDA Floyd Central competition. When shopping at GFS don’t forget to mention Seton Athletics at the checkout to help earn points for athletic events. Support Seton Athletics every 1st Thursday of the month by dining in or driving through at Warsaw Skyline from 4:00-8:00 p.m.. 20% of the proceeds go directly to Seton Athletics the flyer can be found on the Seton website. Enter the codes off of any Coke product, including 20-ounce, 2-liter, 12-pack or case to earn cash for Seton Athletics! Not able to enter the points? Bring your caps or carton codes to the Athletic Office and we can get them entered for you! Head to Coca-Cola Gives at https://us.coca-cola.com/give to enter your points off a bottle or carton of Coke products! To catch the Seton Saints in action, check our website and follow us on twitter @setonhsports. Yearbook Time - Don't forget to purchase the 2018-2019 yearbook for $65. Prices will go up to $85 after December 21. Click HERE to order a yearbook! If your daughter is a senior and you would like to purchase a "senior ad," click on the "recognition ad" under "products" to purchase and build an ad or click HERE. December 9 – CMO Concert 3:00-6:00 p.m.
December 12 – Leadership Assembly, Freshman Christmas Concert 7:00 p.m.
December 14 – Christmas Dance for Juniors and Seniors 8:00-11:00 p.m.
As you’re making your lists and thinking of the perfect gifts for all of your loved ones, here is a special gift for the Saints in your life!